This year at Easter things went well! It is a funny thing when family occasions approach. There is the battle between cooking and cleaning. This year I learned a lesson. Cleaning takes a back seat. You need your house to be not disgusting, but beyond that, don't sweat the cleaning. Cook. With which, here is what I did this year. In our family we cannot decide between ham and lamb and so it is fun to have both. That is what I did. The lamb came from Tops. Yay, Tops! Best price in town, $5.99 a pound. The ham came from Aldi. This was a spiral ham. I am never not doing a spiral ham ever again. So much easier, and I doused it liberally with Spirit Glaze For Ham out of my ancient Joy of Cooking. It gave it a taste of bourbon and of orange. I thought about scalloped potatoes but you know what? Baked potatoes. With sour cream and butter. The potatoes slid into the oven beneath the meat. My sister brought a beautiful salad incorporating cucumbers and beets and Herb Gerard. And for dessert.... here is where my 1980s Betty Crocker cookbook, the classic edition pictured at left, came into play. I had in mind chocolate cream pie and some kind of lemon pie. Haha... opening up this old Pie cookbook I have, I saw that was my plan last year, too! There was a chocolate pie I had made and a lemon pie I had made. I had written notes. The chocolate pie had turned out to be more like a big cookie -- good, and Howard had liked it, but it was not exactly a pie. The lemon pie had been a nice twist. Not a lemon meringue pie, but very good. This is why you write notes! Thank you, last year's self! So I did the Chocolate Cream Pie out of Betty Crocker. The Lemon Meringue Pie was on the next page and so, no muss no fuss, I did that. 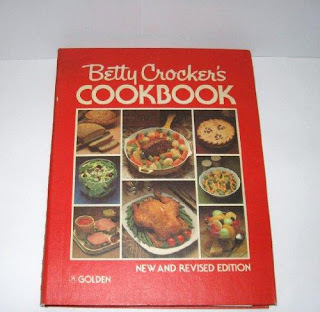 I love Betty Crocker and here is one reason why. Both pies asked for pre-baked crusts. Normally I try to avoid those because you need pie weights, or dried beans, to fill up the crust when you bake it. I don't have pie weights. I did have dried beans dedicated to this purpose but at some point, disgusted with my overflowing kitchen, I tossed them. Betty Crocker just had you pop the crusts in the oven!! No pie weights! No hill of beans! Is that the greatest or what?? Both the pies were a great success. I learned a new art, of making custard. And with a few leftover egg whites I made something else new, a meringue crust. Betty Crocker made it sound easy and, sure enough, it was. Betty Crocker suggested two uses for the meringue crust -- Divine Lime Pie or Chocolate Angel Pie. I went with the Divine Lime, in honor of Christ's divinity. The Divine Lime Pie was the hit of the dessert table along with Apple and Elderberry Pie, made by my brother-in-law David. Even now I remember my slice of that pie with pleasure. It had just a haunting taste, perfect fruit, beautiful spice. It was fun, at work I got to talk to our food critic, Andrew Galarneau, about our Easter table. When I mentioned the Apple and Elderberry Pie, he went, "Whoa. Whoa!" He has as great sense for food. Because that was my thought exactly. Whoa!! You know me, always obsessing over what I eat. But there comes a time to indulge.